In the real world (or at least, the DAX version of it), calendars and dates aren't quite as simple as one would like. This blog shows how to solve a number of common scenarios, including where different tables have different levels of "granularity", coping with special days like bank holidays, handling non-standard finanical year-end dates and dealing with a table which contains more than one date column. Most organisations have a year-end which isn't the 31st December. This blog contains some ideas on how to model this. For this blog I'm going to assume that your year-end is 31st March, but the techniques shown can be adjusted - in what I hope is a fairly obvious way - to suit any year end date. Here I'm using an interim column called FinYearInterim to make my formulae simpler and easier to read. For the first column, this works out whether any given date is before or after March, when the financial year ends; the second column concatenates the previous year's number with the last two digits of this year. This is a formula I put together myself; I suspect there's a more elegant way to solve this! Here I'm showing total sales by species and financial year/month. The problem is that the months aren't correctly sorted - April to December should appear before January to March. If the month number is less than or equal to 3 (ie if it's January, February or March), add 100 to the number. We want to change how the month name is sorted. 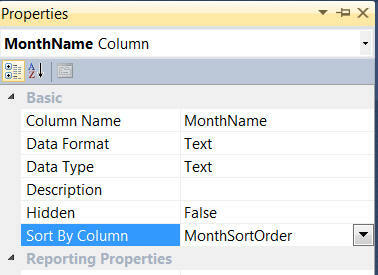 Specify which column SSAS Tabular should sort months by. The months now come in the right order! A typical date function - the [YearEndDate] can be set optionally. Note that SSAS Tabular is intelligent enough to realise that the 3rd argument should be taken to be the year end date, not a filter. The year-to-date figures accumulate up to 31st March, rather than 31st December. For the last two parts of this blog, I'll look at two different ways to solve the same problem: that which arises when a table contains two or more dates.